From start to finish, DBS can transform your basement into a space you will be happy with. We begin by ensuring that your waterproofing system is working properly and is adequate. Our experienced craftsmen know how to overcome every basement remodeling obstacle, including tricky layouts, boxing out ducts, insulation, installing walls and ceilings, electrical and plumbing, heating and ventilation, dehumidification, finishing stairs and landings, and more. We'll take care of every aspect of the job. 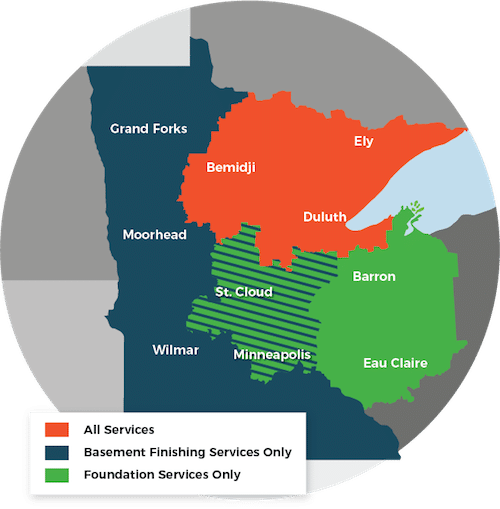 If you live in Superior, Duluth, Minneapolis or nearby areas in Minnesota and Wisconsin, take a look at all of the options below and contact us for a free quote!